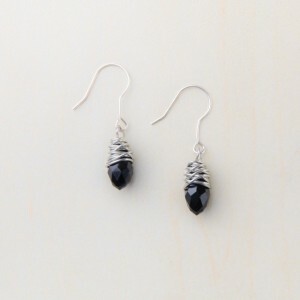 Beautifully cut black onyx teardrops are wrapped in silver wire and strung on sterling silver hooks. Dainty and super original these wire wraps are NOTHING like you’ve seen before. Also in an opalescence bead and gold tone wrap, you will love the sweet femininity of these two pieces.